There is a fellow in NZ who once lectured at an elite foreign military school that trained military and civilian intelligence agents. His position required him to meet certain protocols and standards in order to receive a high level security clearance. In return for receiving that clearance and his lecturing on topics of interest to the intelligence community, he was privy to classified subjects and materials as well as being allowed to interact with the agencies from which his students originated. His students learned foreign languages as part of their studies, combining that with training in the practical and operational skill sets required of them once they graduated and entered the field. After leaving the military education institution, the fellow in question went on to work closely with the intelligence community in his country of origin, eventually taking a fairly senior position within the defense and intelligence establishment and continuing to consult with it even after his departure from active government service. Some time after, he moved abroad and found his way to NZ, where he was hired as a lecturer in politics at the University of Auckland and settled into his adopted country by buying property and engaging in community servcie. He became fairly well known in political circles, wrote academic titles on NZ and comparative foreign policy and engaged with government on topics of common interest. The question is: is this guy a spy given his past? Could he have come to NZ as an undercover “mole” ready to be sprung into service by his foreign masters after lying dormant for some time? 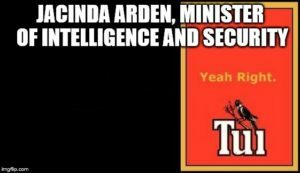 I ask because another former University of Auckland lecturer now in public service as a parliamentarian has found himself under some scrutiny after it was revealed that he also had lectured to intelligence agents at military educational institutions in his country of birth. It seems that there are questions as to whether he left that life behind him when he came to NZ even though his academic and community life in NZ broadly resemble that of the first individual mentioned above. But now the political knives are pointing at him. It seems to me that the question about whether either individual is a spy reduces to two things. What were the cirumstances surrounding their emigration from their countries of origin, and what sort of security vetting was done on them before they took up residency and later, when one decided to enter public life? In both cases security background checks would have been done as part of their visa appllication process. In both cases the University of Auckland would have presumably checked their academic credentials (which is an issue because the second fellow apparently fudged his academic credentials on his citizen application form, which makes one wonder if due dilligence was done on him by the UA prior to it recommending him, as an employment sponsor, to immigration authorities). For the individual who entered public service, more extensive vetting conducted by the SIS or an agency contracted by it would have examined the case a bit more in depth. Based on what I know of the second case so far, the individual in question is no more a spy than the first guy is, and the first guy is clearly not. The problem for the second guy is that he comes from a country ruled by an authoritarian regime with neo-imperialist ambitions that is known to use its diaspora as a human intelligence collection network, where emigrants take out citizenship and settle into target countries but continue to report back to intelliigence authorities in their homelands. For his part, the first guy was more involved in his home country’s intelligence community prior to his arrival in NZ than the second guy apparently was (as far as has been reported), and the first guy’s home country has an extensive record of imperialism, including covert intelligence collection in NZ and elsewhere in the South Pacific that historically dwarfs that of the second guy’s motherland. Unfortunately for the second guy, his country of origin is not a NZ intelligence partner like the country the first guy came from, and in fact is a major counter-intelligence target for NZ security agencies. So the question remains: can either or both of these guys be legtimately called a “spy” based on their backgrounds prior to arrival in NZ? I ask because I am the first guy and I do not like being misidentified without cause (as I have been from time to time). It is unfortunate that my former colleague now stands accused (even if by insinuation) of something that he might not be based on assumptions about what he used to be. For his sake as well as that of NZ security, it is appropriate and necessary for the SIS or other NZ security agencies (not the government of which he is an MP) to issue a clarification on the matter now that the question has been raised in public and there is a cloud over his career and reputation. Tags: Foreign policy/affairs, Intelligence, Security, Yellow peril?